I was in Boston for a couple of days last week. On the top of my list of things to do there was my first ever, long overdue visit to the fabulous Isabella Stewart Gardner Museum. Adding to the mystique of the beautiful outside-in Venetian palazzo that Gardner herself designed and its dazzling array of masterpieces and artifacts, was my curiosity about the still unsolved 1990 Gardner Museum heist. 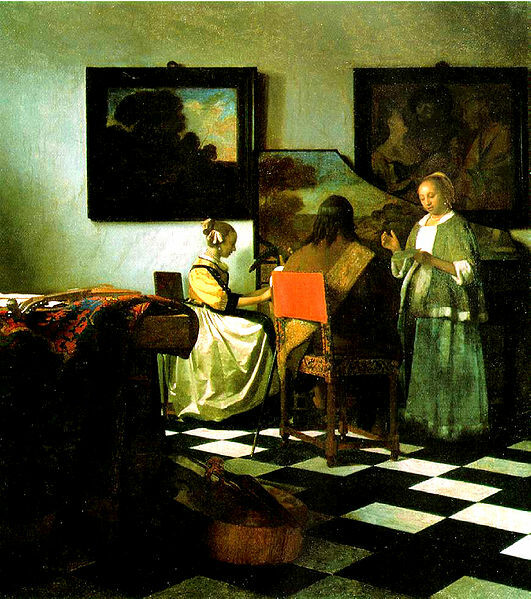 Thirteen masterpieces, including three Rembrandts and a Vermeer, were stolen. Some were slashed from their frames -- frames that still eerily hang where Gardner originally placed them. 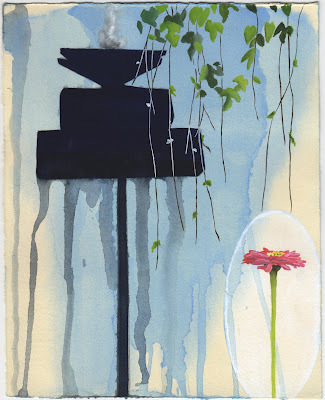 After my visit, I arrived back in L.A. pleasantly haunted by the history-laden cobblestone streets and cemeteries of Boston, and decidedly under the spell of Isabella Stewart Gardner. Finding Rebecca Dreyfus's 2006 documentary about the Gardner heist, Stolen, was the perfect segue from an all-too-short vacation back to my hectic life. In an interview, Gardner biographer, Douglass Shand-Tucci, sets the tone for the present day visitor and echoes my own feelings: "The Gardner Museum is now touched with evil as a result of the robbery in a way that has deepened the experience going through it. Many people made it into a pretty postcard kind of place. Mrs. Gardner was not a pretty postcard kind of person . . ."
The story of the heist is set against a background of grainy black and white footage of turn-of-the-century Boston, voice-overs of Gardner's letters read by Blythe Danner, and the ongoing investigation of fine art detective Harold Smith. Adding to the complexity of the investigation, we intermittently hear snippets of voice messages left on a tip line -- even one from a who woman claims the culprits were John Lennon and Paul McCartney. The Beatles did it! "They say that Isabella Stewart Gardner is the original Victorian salvage hunter. She'd go off on a rummage hunt, often a salvage hunt. Mr. Gardner would be, at times, very upset. She wouldn't leave a note at the hotel, she'd be out looking for her favorite pieces of salvage that she could save and then resurrect them. Broken columns, balconies, fireplaces from Northumberland, were in attics and basements of churches, stained glass windows from 1150 a.d., [unclear] Cathedral covered with vestments and cobwebs, and she recycled all the things in Europe that no one seemed to care about." In a letter to her art agent in Europe Stewart wrote: "Dear Berenson, I suppose the picture habit, which I seem to have, is as bad as the morphine or whiskey one. And it does cost. I am drowned in a sea of debt. You would laugh to see me. I haven't had but one new frock in a year." 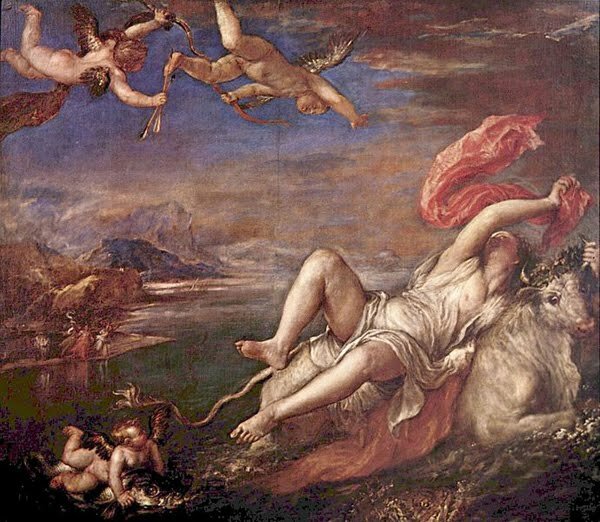 "One evening so ecstatic, after a wonderful dinner party in the Titian room, she swirled into a frenzy and said, 'Tis I who have hopped upon the back of Zeus and become Europa, the mother of Europe' and left her ball gown. Of course as we all know in the portrait the goddess is upon the back of Zeus flying around the heavens in a night gown. So Mrs. Gardner disrobed her ball gown, ran through the long gallery back up to her dressing room on the fourth floor, changed into another gown and came back downstairs. So, for posterity, the green moiré fabric, Worth’s Paris gown, is in the wall, under the Titian as sort of a replica and souvenir of the enchantment that Bel Gardner felt when she received and purchased her Europa. She was ecstatic with joy." "In 1990 at the time of the Gardner heist, Whitey Bulger was the absolute lord and master of the Irish underworld. . . . Whitey Bulger had a dark presence that cast a very long shadow over Boston. Chilling is the word. . . He ruled through violence and intimidation and fear. . . . In this town, if a consortium of thugs pulled off the Gardner heist, Whitey Bulger would hear about it in two seconds flat. " By the end of the film, the investigation has widened to include IRA connections and never realized plans to use Senator Ted Kennedy as a go-between to negotiate for return of the stolen work. Art detective Harold Smith stayed on the trail of the theft until just a week before he died in 2005, and many others continue the hunt to this day. Ray "Whitey" Bulger was arrested by the FBI in June of this year and is in custody in Boston charged with 19 counts of murder. Some speculate that Bulger knows the whereabouts of the stolen Gardner paintings and is using the information as a get-out-of-jail free card. We can only wait and hope! Click here to rent or learn more about Stolen. Click here to read my review of Ulrich Boser's 2009 bestseller, The Gardner Heist. Very interesting topic! I'd sorta forgotten about the heist and didn't know about the possible ties to Ray "Whitey" Bulger. I had no idea Boston was such a great place to visit! I love the history and famous houses of authors, etc. Global Visas never leave any Immigration case to chance and are proud of our 98% success rate. It’s just so neat to see where such great books, by the way your post is great I enjoyed reading, thanks for sharing.